While on his first hunt with his tribe, young Keda is pushed off of a cliff by a buffalo. Keda fell a long way down and was left for dead. However, Keda had only blacked out. He soon wakes up and far from home and has to survive the wilderness alone. Keda forms an alliance with a wolf that was abandoned, and they are both now trying to survive the harsh winter that is coming, as well as many other dangerous creatures. Alpha is a drama and thriller movie that was released on August 16, 2018. It was directed by Albert Hughes, who is best known for producing The book of Eli, Menace II Society, From Hell, and Dead Presidents. Keda, who is the main actor, was played by Kodi Smit-Mcphee. Kodi has also been in many other movies, and Alpha was one of his best movies to act in. 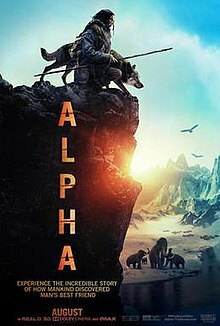 Alpha has been one of the best movies I’ve seen. I liked how a human bonds with an animal that could have killed him. Their bond was strong and they did not leave each other’s side. I like the movies time set and it showed me all the things people had to do back then. Their way of living was so different than typical, and they had to work hard in order to live. I would recommend this movie to anyone one and I know I would definitely watch this again.